Thinking about starting a t-shirt business? Have a look at an overview of the best dropshipping websites and see pros and cons of them all. Figure out how to integrate your t-shirt shop with your website! Dropshipping is a process in which a retailer passes customer orders to a supplier partner, who then ships the order to the customer. By dropshipping, you can save up a lot of money from printing equipment, printing materials, you won’t have to purchase and store blank t-shirts at home, and you can forget about packaging and shipping too. Starting a t-shirt dropshipping business is an excellent idea because it has very low upfront costs with a huge growth potential. As easy as it sounds, you still need to put a lot of effort in creating amazing t-shirt designs and promoting your t-shirts and website to drive traffic and start making sales. Allowing the experts to fulfill client’s orders leaves you with the sole responsibility of setting up a beautiful website, optimizing it for search, and promoting it day and night until it gets off the ground. Good news is, there’s a handful of easy to use tools to help you set-up an e-commerce enabled website to start selling t-shirts and all sorts of apparel online with your brand and your designs. Eager to get started? Go try the t-shirt mockup generator tool which will help you boost your t-shirt business along the road. By choosing a t-shirt drop shipping business model, tshirtpreneurs like yourself can stop worrying about having to purchase wholesale t-shirts, print designs on them, and have them shipped to the end-customer. Dropshipping is, in most cases, an artist’s optimal distribution channel. 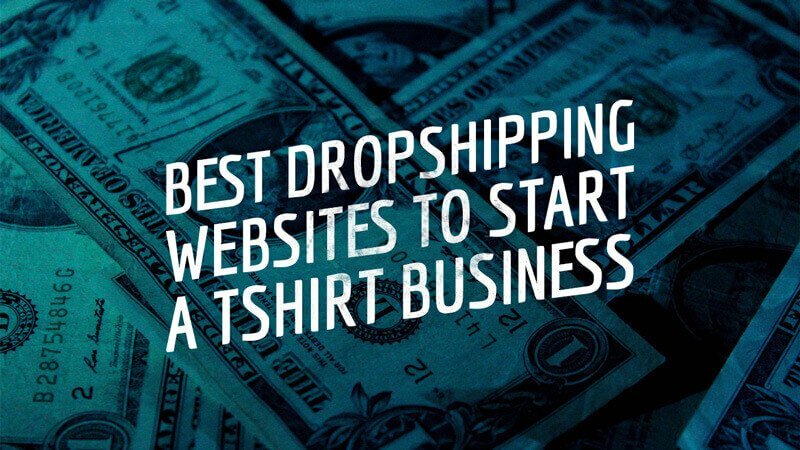 To help you get started selling t-shirts from your own website as soon as possible, in this blog post, I will show you which are the best dropshipping sites for your t-shirt business and the reason why you should partner with one of the drop-shipping companies on the list. Let’s do this! Without a doubt, Printful is the t-shirt dropshipping leader. With almost 8 years in the business, Printful now provides top of the line dropshipping services for everyone. With the best social media following base and highest domain authority ranking among the dropshipping companies analyzed in this blog post, it makes sense to talk about Printful first. 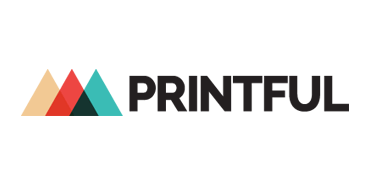 Printful’s name is a combination of the two essential parts of the company’s service – print products and fulfillment. Having locations in both the USA and Latvia, allows Printful to offer a fast and reliable service to most countries in the world. What I certainly liked about Printful and what differentiates it from other t-shirt dropshipping sites is the amount of e-commerce platforms Printful is partnered with and the possibility of custom branding the products you sell. You can integrate Printful to: Shopify, WooCommerce, Storenvy, BigCommerce, Gumroad, Tictail, Big Cartel, Ecwid, Amazon, Etsy and Weebly. Maybe having this big amount of business partners is the reason why Printful printed the staggering amount of 1,440,201 t-shirts in 2017 that now add up to a total of 4.3 million products printed by Printful since 2013 until now. With custom branding, you get the opportunity to wow your customers by sending custom stickers with your branding on every purchase. Your customers will gladly paste these stickers on their belongings, becoming brand ambassadors and helping your business reach wider audiences. Remember, it’s all about the details! With Printful, you get to choose how much profit you want to make out of your orders. Their profit calculator allows you to see how much you could potentially be earning per successful purchase. A minimum profit margin of 30% is recommended. Here’s a spreadsheet with Printful’s items and shipping costs which I’m sure you will find useful. So How Does Printful Dropshipping Service Works? Once you configure your shop and set up your website you will be more than ready to sell. The way it works is pretty straightforward as the following graphic shows. 1. You set up your store and upload your unique designs. 2. A customer purchases on your site. 3. Printful automatically receives the order, processes it, and ships it. 4. Your client receives your item. Considering printing and shipping times, customers can expect their t-shirts to be on their doorstep in about a week. Domestic deliveries are always sent with tracking codes! For all orders being shipped outside of California and North Carolina, you’re not required to pay tax, which is awesome. What are Printful’s most popular t-shirts? What else does Printful offer? Printful has done an excellent job on the tutorials side as well, make sure to check their YouTube channel. Also, don’t forget to read their guides and FAQ section, this will help you prepare your art files before submitting them to Printful and have them ready for sale. Now, Printify is a whole new thing. 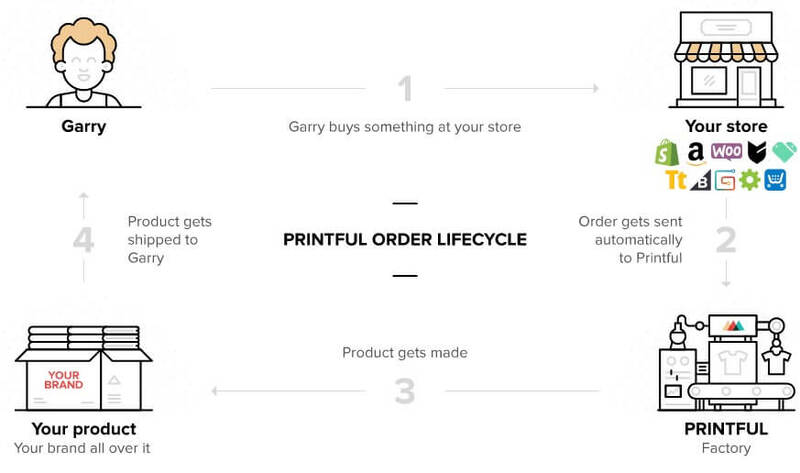 Printify is like the Uber of the Print on Demand Drop Shipping websites since they don’t really own any printers! What Printify really has is a great technology that connects your favorite E-commerce Platform (e.g. Shopify, WooCommerce) with printers, dropshippers and your customers. When you publish your Printify products and clients buy your them on your Shopify or WooCommerce store, Printify will send orders to production and shipping directly to your customer – with your branding. Printify allows you to reduce costs by choosing the print company to work with. It wouldn’t make sense to have t-shirts manufactured in east Europe when your target market is on the West Coast. Those t-shirts would end up having high shipping costs that your final customer would have to pay. Printify allows you to choose a print shop located as close as possible to your target audience and this way help your customers get your t-shirt designs for less and way faster! You don’t have to pay any monthly fees – pay only per fulfilled order. This means that you can also choose what items to sell by Print Provider. Your items’ final pricing then depends on a few different variables. You can select them by price, quality, and location. There are different available t-shirt models, manufactured different brands, and sold by different providers. Before you choose the t-shirts you want to sell, you need to have a clear understanding of which brands are suited for your online t-shirt shop. You can choose from different print providers located in the United States, China and in the United Kingdom. What’s Else is Good About Printify? Printaura is also a great company to choose as a t-shirt drop shipping partner. Talking about functionality, Printaura and Printful offer practically the same services. Printaura prints and dropships a huge variety of products enabling thousands to sell high-quality goods on their own websites and allowing customers to purchase amazing designs from every corner in the world. Headquartered in New York, Printaura is able to offer international shipping at affordable prices. Again, what’s great about a dropshipping leader like Print Aura is that your items are labeled with your brand logo and you can include branding stickers and alike with every shipment, making your customers fall in love with your brand. Your customers won’t have the slightest clue that you are running a business with your mere laptop. You can connect Printaura with Shopify, WooCommerce, Etsy, Storeenvy, Opencart and Bigcommece. Talking about website aesthetics, an update to their website design would certainly make it compete with Printful. Printaura’s website is not as easy and intuitive to navigate, but still, it’s not that complicated either. Teelaunch is another leading print on demand fulfillment company. By simply uploading your designs you will be able to have them printed on over 35 different physical items which your clients will be able to order online straight from your website. T-shirts, pillows, mugs, posters, stickers, cutting boards, pet beds, you name it! Teelaunch is the perfect partner for your Shopify powered store since it is exclusively made for Shopify. With 14 production facilities around the world (United States, Canada, Australia and the United Kingdom) Teelaunch is able to serve globally. With only 2 years in the business, Teelaunch now owns a slice of the big dropshipping pie and will continue to grow if they keep providing such a good service. Teelaunch will immediately send you to the Shopify Apps website to link your Shopify account with Teelaunch. The process is pretty straight forward. Teelaunch’s marketing efforts are significantly smaller when compared with Printful and Printaura. As Teelaunch keeps growing, its marketing team should as well and we will start seeing more on the Internet about this great dropshipping company. Teelaunch doesn’t have video tutorials like Printful or Printaura to help you out all the way through your t-shirt venture. A few guidelines are shown and that’s it. It works with Shopify and Etsy. Here’s a spreadsheet with Teelaunch products costs. Thinking about selling custom t-shirts and merch? CustomCat could be the partner you are looking for. With more than 17 years in the business, CustomCat now has one of the most productive production and fulfillment systems in the business. Located in Corktown, Detroit, CustomCat provides Direct-to-Garment (DTG), Embroidery, and Dye Sublimation decoration for over 500 products and merchandise. CustomCat connects seamlessly with your Shopify or WooCommerce powered website. CustomCat pricing is surprisingly low when compared to other companies. It takes on average 2-3 business days for items to be produced and shipped from their facilities and it takes less than a week for items to arrive to a domestic destination and no more than two weeks to reach an international destination. The CustomCat catalog includes everything from t-shirts and hoodies to smartphone cases, dog leashes, laptop sleeves, beer steins and more! Are you more of a visual person? No worries, I’ve set up this Dropshipping Websites Directory for you. This t-shirt dropshipping directory shows the contact information of each company and the brand and garments you can sell through each of the dropshipping companies reviewed on this post. You can also find out to which e-commerce companies you can connect your t-shirt business to and the estimate fulfillment and shipping times of each of these dropshipping companies. You might be wondering, what’s Shopify and why are all these companies partnering with Shopify. Shopify is an e-commerce company that has developed an easy to use online platform for online stores and retail point-of-sale systems. Shopify is the tool that both beginner and advanced e-commerce business owners use. Here’s a great Shopify guide for beginners to start selling T-shirts on Shopify on the right foot. Shopify offers a 14-day free trial for you to get used to it and connect a Dropshipping website to your Shopify account. It’s a fully functional trial period that you should use to test the many Shopify functionalities and get used to Shopify dashboards. Shopify has 4 different pricing plans, Lite Shopify, Basic Shopify, Shopify, and Advanced Shopify. You will probably be just fine with a Basic Shopify account which costs $29 USD and includes everything you need to get started. You can find in this post a link to an extended trial period. Once that you have your Shopify account up-and-running you will be able to connect to any of the previously mentioned drop shipping companies and start selling your awesome t-shirts in no time. Well, Shopify looks cool, is there something more to it? Yes there is! Shopify and your Drop Shipping company of choice can be both super-powered by Shopify apps. Some of my favorite apps are ones that allow you to “upsell” merch. These apps will show related products to your customers when they are about to complete a purchase so that they can add more items to their order. There are many more useful apps for Shopify that will boost your Shopify-powered e-commerce website. Google “best shopify apps” whenever you are ready and get started with the right foot. Another great Shopify advantage is that by following a few simple steps you can connect your Instagram Business account to it so that you can sell t-shirts directly via Instagram! Check this guide we prepared for you explaining you how. WooCommerce is another excellent e-commerce solution for building your online t-shirt business. WooCommerce works exclusively on WordPress and it integrates perfectly with it. WooCommerce has extensions that will boost your t-shirt selling efforts. No coding experience needed at all! 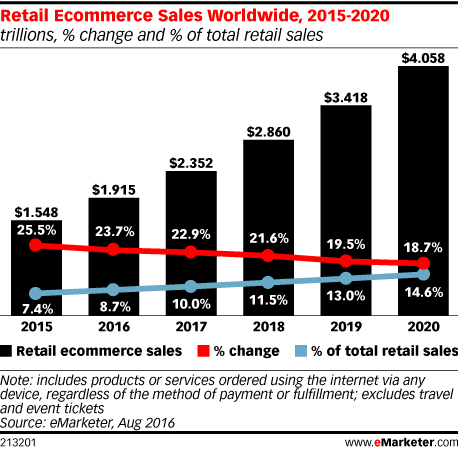 WooCommerce doesn’t take a cut of any of your sales, which is great. To take payments directly on your online store you can use a WordPress plugin like Stripe which is one of the leading online payment gateway companies at the moment. 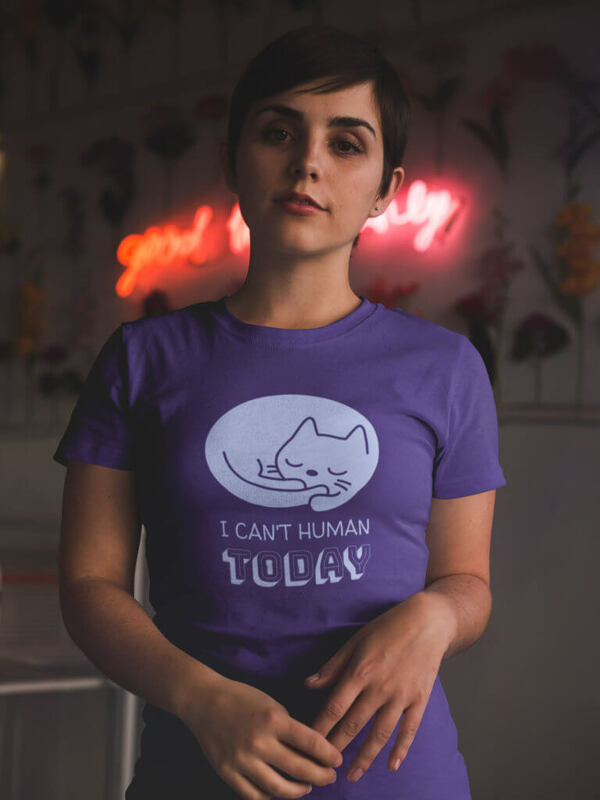 Another cool feature is that you can sell t-shirts directly through your Facebook Business page which is where your target audience may be spending a lot of their time online. What WooCommerce lacks is a dashboard view similar to the one Shopify has, which allows you to review your performance at a glance. While it isn’t integrated from the start, don’t worry, there’s a plugin for that. If you already use WordPress or you’ve used WordPress in the past and you feel comfortable on the WordPress environment you will definitely love and find the WooCommerce plugin very easy to use and set-up. Yes, I Know How to Use WordPress and I Want WooCommerce! Great choice, read the WooCoommerce Setup Wizard and get started ASAP! While most of the dropshipping companies mentioned above have their own t-shirt mockup tool, none of those tools beat Placeit’s t-shirt mockups. So you might be wondering, what do I need to create t-shirt mockups? It’s easy, you just need your art file in JPEG or PNG and simply upload it to one of the many templates featuring real models which are available in Placeit. T-shirt mockups allow you to promote your designs the best way possible. Once you upload your t-shirt designs to your website you still need to do some advertising to let the world know about your new venture. No business is successful without marketing. Using t-shirt mockups gives you the possibility of showcasing your designs in a professional way that will result in sales! Have a look at this t-shirt mockup featuring a good looking guy with tattoos! Someone could think that in order to have a clothing brand succeed, you’ll need to invest in finding models to promote your t-shirt designs and arranging photoshoots that will make your brand stand out, wrong. Here’s where Placeit comes to the rescue. Simply upload your design, resize it, position it, and voilá, you will see your design on a t-shirt. Click on the image below to get started! On Placeit you can find templates with models from all over the world wearing t-shirts that you can customize with your own t-shirt designs. Forget about organizing an expensive photoshoot or wasting hours in Photoshop. Placeit’s interface is super easy to use. Want to try it? Click on the image below! Placeit is meant to be as easy to use as possible. 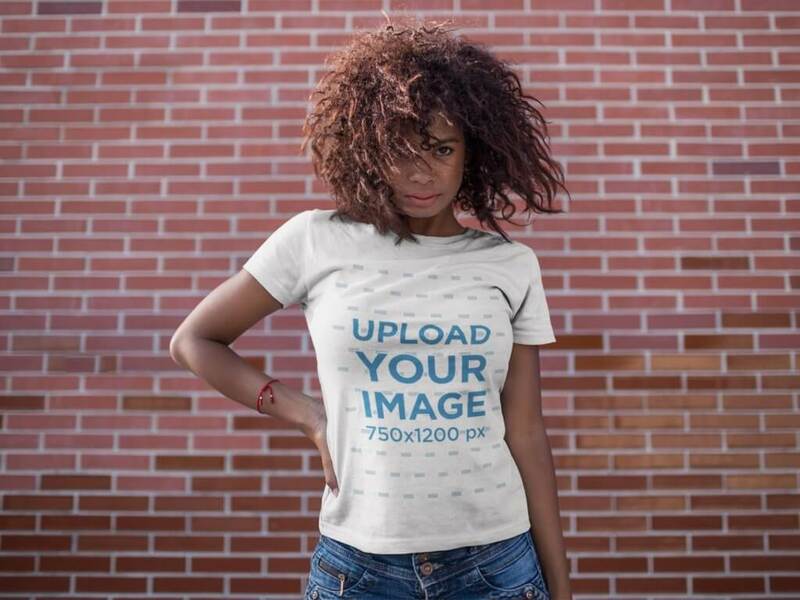 To create a t-shirt mockup you will just have to upload a t-shirt design, then place it in whatever position you wish and voilá you will have your design on a t-shirt in seconds! You can use these images on your website, on your Facebook Business Page, on Instagram, on your e-mail newsletter, anywhere! Using mockups is a great way to display your designs with real products being used in context, especially because you will want to give your potential clients a real idea on how your t-shirt will actually look like. Placeit makes it really easy for you to create outstanding t-shirt mockups, so don’t think about it twice and start using it right away! Click Here to Customize This Video! Ready to create t-shirt mockups straight from your browser? Visit Placeit now! 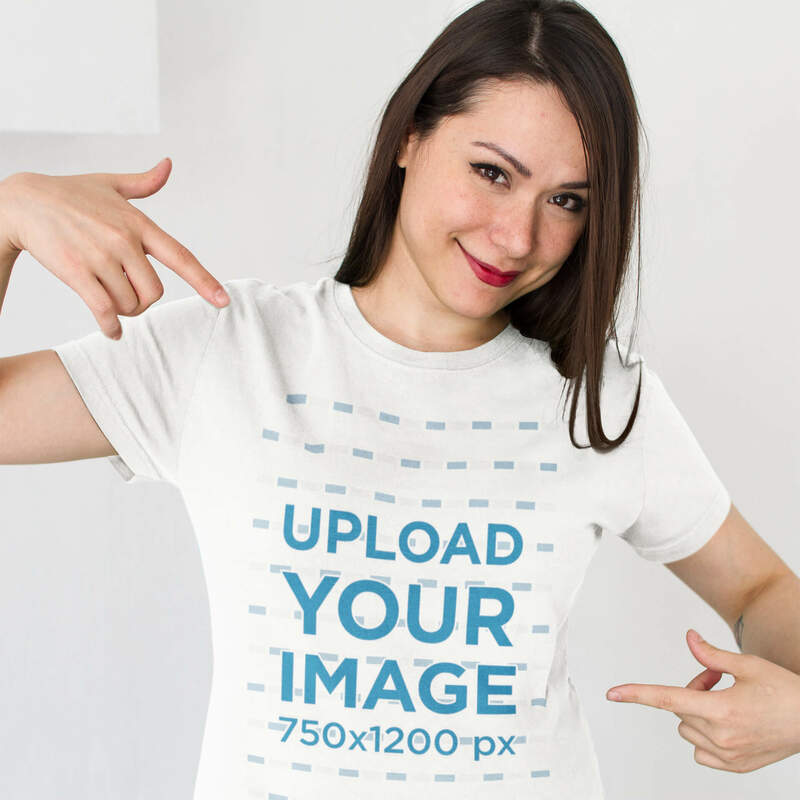 Create T-shirt Mockups with Placeit! Coming up with a winner t-shirt design may be time-consuming. If you’re trying to keep your reel updated at a fast pace, check out Placeit’s T-shirt Design Maker. It’s incredibly easy to use, simply pick from a number of themed templates and customize everything from text, fonts, and colors to images and icons. Create beautiful designs and display them on your online shop in minutes! 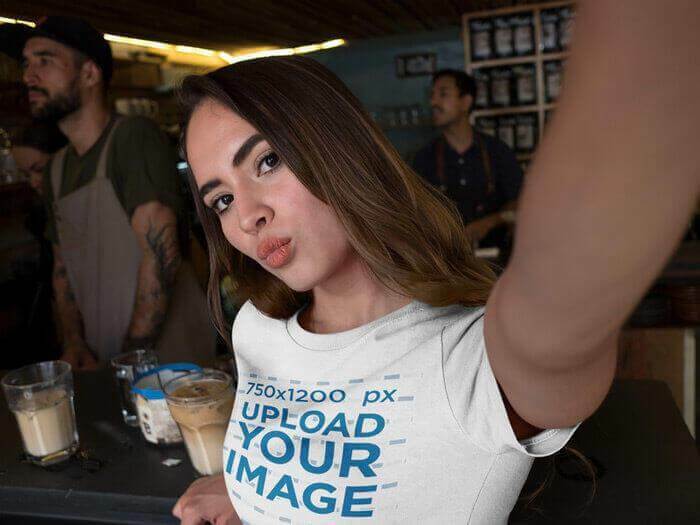 Finally, we advise you to post your t-shirt mockups on your Social Media as it is an effective marketing channel (plus your brand will look super pro). Take this effort one step further by creating specific images for your posts with Placeit’s Social Media Image Maker. You won’t have to worry about size specifications since the templates got this covered for you. That’s it! Put these tips on practice and improve your t-shirt business’s image to sell more! Sell t-shirts online with the maximum profit by using any of the services mentioned above. Selling t-shirts from your own website and partnering with a drop shipping company has many benefits. Once you get some experience selling t-shirts online you should consider expanding your product line. As seen on the Print on Demand vs Dropshipping Case Study on our blog, when you sell via a print on demand website there’s no way to track who visits your website which means that you can’t retarget these users; by having your own website you can show ads to people that visited your shop but didn’t purchase, this is called retargeting and it can be done through Facebook Ads or Google AdWords to show your products to these users while they are surfing the web. To learn more on how to optimize your keywords for ads and for your website go to our Best SEO Keyword Tips for Your T-Shirt Brand. Also, if you only sell on a marketplace like Redbubble, Society 6, or alike, people can get distracted with designs from other artists, which is why a big advantage of having your own website is that your customers will focus solely on your designs. In this article, we went through the best companies for drop shipping t-shirts in 2018. They manufacture and print high-quality garments to offer the highest profit margin for the seller. Whether you are looking for DTG printing, screen printing or sublimation, these sites can handle all kinds of requests. Don't forget to check the T-Shirt Business Category on the blog for more tips and tricks to boost your sales! Good luck selling t-shirts online in the most profitable way, with minimum upfront investment. No more t-shirts pilled up on your garage! Just you, your computer and the coffee machine. Wait no more, get started today. "My t-shirt designs look awesome on Placeit's mockups"
Wondering what's the best way to sell your designs and t-shirts online? On this post, we compare Print on Demand vs Dropshipping Websites Services so you can make the right choice and start selling online as soon as possible!